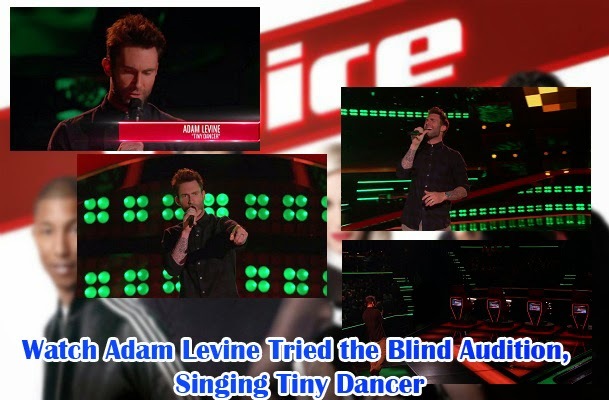 The Voice coach Adam Levine tries out the pressure of the Blinds Audition singing his own rendition of Elton John’s Tiny Dancer on March 2, 2015. As it turned out, the Maroon 5 vocalist is a four chair turner himself. With the first few words of the song, the three other coaches had turned to him. Not satisfied with just three turned chairs, he asked Pharrell Williams to press the red button on the empty chair, making Adam turn for Adam. At the end of the performance, Levine reminded everyone that he has to pick a coach. He took some time to reveal that he would like to join Team Christina who had jokingly said that she would gladly help him reach the top of the competition. Blake Shelton on the other hand shared, with sarcasm, that he did turn because the man was good, he just wanted to see what he looked like. While others were in awe of Adam Levine’s performance, some say that it will also be interesting if the other coaches did not know that it was him. Some netizens had shared their ideas that maybe it is time that some professional artists could try the Blinds Audition. Others say that it might be interesting to see and hear some coaches in hiatus to try out too. The video of Levine’s audition had been uploaded on YouTube with The Voice and had reached more than 1.5 million views in five days. Some comments made jokes that the man singing on the blinds ‘look a lot like Maroon 5 lead vocalist’ like others say that ‘he seemed to be the guy who sung ‘Sugar’.